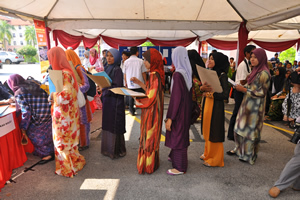 BANGI, 2 Sept 2012 – More than 3,100 candidates offered places of studies in The National University of Malaysia (UKM) registered for their undergraduate courses in the campus here today. The University offered a total of 73 programs (50 in the Sciences and 23 in Arts Stream) for the first semester of the current 2012-2013 session. Females students continue the trend in dominating the males at 2215 (71%) against just 917 males who registered. UKM Vice Chancellor Professor Tan Sri Dato’ Wira Dr Sharifah Hapsah Syed Hasan Shahabudin and the university’s top management made their rounds to the residential colleges, where the registration process was carried out, to welcome the new students. Prof Sharifah Hapsah told the freshmen they were lucky to be selected to study at UKM because it was now internationally recognised as one of the best in the country. Those who did not make UKM as their first choice will realise the eminence of the university once they start their respective courses, she said. A total of 21 candidates comprising 12 females 9 males put off their registration today.